Submitted photo Wright State will launch a pilot project to negotiate lower prices for textbooks and online access content on behalf of its students. 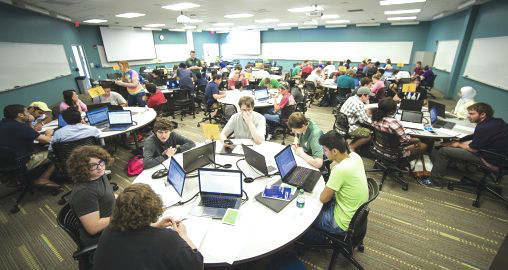 FAIRBORN — An innovative program called Inclusive Courseware that promises to dramatically reduce the cost of textbooks and/or online access content for students is on the launching pad at Wright State University and could serve as a model for the rest of the state. The Wright State Board of Trustees heard a presentation Oct. 6 about a Faculty Senate resolution that would create an “inclusive access” pilot project that would enable the university to negotiate the price of textbooks and online access content on behalf of its students, using its collective power. “It doesn’t impinge in any way on a faculty member’s ability to choose a book. It just provides a vehicle for collective negotiating,” said Wright State professor Dan Krane, chair of the Ohio Faculty Council and chair of the Wright State Task Force on Affordability and Efficiency. Krane, who has been on a team developing the program from the start, said textbook costs have significantly outpaced inflation for the past 15 to 20 years, a trend that studies have shown has adversely affected student performance and the way faculty teach courses. Students sometimes choose not to buy the textbook or online access content and try to muddle through the course without it, putting them at a significant academic disadvantage. Other students may delay buying the textbook, forcing faculty to get the class off to a slower start and reducing the overall effectiveness of classroom instruction. Krane, who teaches introduction to biology, has seen it firsthand. The largest class at Wright State — with 460 students — class attendance had historically declined 30 to 40 percent by the third week. Over the summer, Krane completely redesigned the course and switched from a textbook that cost $235 to an open educational resource, or a free book. That enabled him to begin giving weekly quizzes since all of the students had the book. Class attendance soared to more than 80 percent. In the pilot project that will be launched in the spring semester of 2018, the Inclusive Courseware initiative will be used in six courses, resulting in an estimated savings to students of almost $50,000. The pilot will then be expanded and integrated into banner in a way that allows an increase to at least 20 high-enrollment courses in the fall semester. Students will know that they are benefiting from this program if they see the description “Inclusive Courseware” for a fee that will be associated with the course when they register. If inclusive access was adopted by all of Ohio’s four- and two-year public colleges and universities, Krane says, it would save students at least $300 million a year. The Faculty Senate resolution also calls for the provost to explore ways to make $10,000 available to incentivize faculty to adopt or adapt open educational resources for high-enrollment courses. Currently, individual students order textbooks through the bookstore and are charged “list price” by the publisher. With the Wright State Inclusive Courseware approach, the university orders textbooks through the bookstore for all of the students who need them and gives the publisher the price the university is willing to pay. The publisher then gives the university the list of textbooks it is willing to sell at that price. If the faculty member agrees that one of the textbooks is acceptable, then it’s a deal. If not, the faculty member selects the textbook he or she wants, and the students pay list price, as they have done before the program was available. Students are charged an Inclusive Courseware fee to cover the cost of the textbooks when they pay tuition, but they can opt out of that fee if they choose to buy textbooks on their own. The handful of institutions that have used inclusive access typically get textbooks for 50 to 70 percent below list price and much less than the wholesale prices, Krane says. He said publishers have an incentive to use inclusive access because they currently capture only about 30 percent of the textbook market for a class since many students choose to not buy the textbook or to buy a used book or a book from a wholesaler. Inclusive access would give publishers virtually 100 percent of the market, he said. The Faculty Senate resolution comes in the wake of a recommendation by the Governor’s Task Force on Affordability and Efficiency in Higher Education that all institutions of higher education in Ohio explore means of reducing the cost of textbooks and report annually on their progress. During the 2017 spring semester, Wright State Student Government adopted a resolution that urged faculty to consider less expensive course materials without compromising the quality of instruction. A working group was formed to address the issue of textbook affordability and access to course materials. Representatives of campus stakeholders met weekly over the summer and developed strategies and initiatives. Austin Rains, student member of the board of trustees and part of the textbook working group, said the most exciting part of the initiative for him is the fact that the university and all of its constituencies are working together to solve problems for students. https://www.fairborndailyherald.com/wp-content/uploads/sites/50/2017/10/web1_student-success-center-classroom-16230-179-508×270.jpgSubmitted photo Wright State will launch a pilot project to negotiate lower prices for textbooks and online access content on behalf of its students. Story courtesy of Wright State University.